The dramatic rise of China’s automotive industry, in terms of both consumer demand and production supply, is truly unprecedented in the history of the industrialized world. No country has risen from a nearly standing start to the size and scale that China has achieved in such a compressed time frame. It was, after all, just 17 years ago when Deng Xiaoping made his now-famous visit to Shenzhen where he announced the creation of Special Economic Zones and thereby sparked China’s wave of economic momentum. The logical question to ask is whether this momentum is sustainable, particularly as it relates to the most iconic of consumer goods: the automobile. The last of the Eight Overarching China Automotive Trends That Are Revolutionizing the Auto Industry addresses the underlying socio-demographic forces that are driving the recent economic developments in China: and why there is every reason to believe that, barring unforeseen geo-political instability, China has a very bright automotive future. Since the early 1990s, China’s economic development has been centered the metropolitan areas of China’s coastal regions and surrounding areas. Shanghai, Beijing, Guangzhou and Shenzhen are typically identified as “Tier 1” cities with the highest income, largest population base and largest GDP. This is followed by a group of 21 “Tier 2” cities. Chongqing is the largest municipality with a total population of 32 million residents, however only 6 million are considered urban. Other Tier 2 cities include Dongguan, Nanjing, Wuhan, Hangzhou, Shenyang, and Harbin. Smaller cities such as Zongshan, Xiamen, Changzhou and Zhuhai are also included because of their higher per capita GDP. Over the last decade, a set of third-tier “emerging middle class” cities have also emerged, including cities like Dalian, Qingdao, Shantou, Kunming, Zibo, Huizhou, Shijiazhuang. A fourth-tier “next wave” group of cities is also beginning to emerge as economic development begins in earnest in yet another group of mostly interior Chinese cities. And finally “rural” and “remote” population groups complete the classification of the Chinese population of over 1.3 billion people. In fact, the emergence of this multi-tiered structure is a result of the economic development path that was initiated by Deng Xiaoping. Prior to this, over its history of nearly 5000 years, China had been a rural and agricultural economy. In the space of just few decades, a significant percentage of the population of our planet has migrated to the cities of “new China”, and in the process these people are moving from poverty to prosperity. At the start of the reform era, 82% of China’s population was considered rural. By 1990, this percentage had declined to 74%. By 2000, the percentage was 64%. In 2008 this had further declined to 55%, or approximately 720 million people. Clearly, these shifts represent a migration of population towards the areas of economic development and concentration of wealth. The creation of new wealth has had a profound impact on the development of the cities across all of the previously described “tiers”. This has also impacted the development of rural areas as urban wealth has a positive impact on extended family members who remain in the rural population. While China possesses a migrant workforce of over 200 million people, there is no mistaking the trend of permanent migration of rural population to existing urban areas. Looking forward, it is expected that nearly two-thirds of China’s population will be in urban areas by 2020. This represents a whopping rise in urban population of nearly 200 million people in just over 10 years. Essentially, China creates the population-equivalent of a city of between 1.5 – 2 million people each month! It is no wonder why China’s cities are continually under construction. A growing middle-class is emerging in these urban areas. If we define “middle class” as people with annual income greater than 150,000 RMB ($22,000 US), this number has increased from 1.5 million to 4.8 million individuals from 2000 through 2008. This number is expected to increase to over 40.3 million individuals by 2020. The China government estimates that there are over 45 million families that have reached the threshold of 30,000 RMB ($4,400 US) of expendable money, which is considered a threshold for entry into the car buying population. Urban wealth accumulation is undoubtedly fueling the growth in automotive sales. The fact that 85% of all vehicles are sold to urban residents is a clear sign of the relationship. The growth of a more affluent urban middle class, combined with a generation that has lived under a one-child policy is creating yet another consequence: wealth accumulation for an increasing number of middle and older age groups. By 2020, it is estimated that China’s population will grow by approximately 110 million, yet the number of individuals over 45 will increase by 118 million. It is also expected that the population of individuals between 25 – 44 will shrink by 22 million. This has significant implications for product preference, as middle-aged and older consumers tend to seek more luxurious products. The statistics on urbanization, income growth and population demographics point to very favorable conditions for the continued robust growth of the automotive market. However, many people question whether China has sufficient infrastructure to handle the increased volume of cars and whether resource constraints (people, energy, investment capital) may eventually limit the growth of the market. While these are all legitimate issues, it is useful to first view China’s automotive development in contrast with that of other developed countries. A commonly used benchmark to compare the development of the car industry across markets is cars per 1,000 of population. On this measure, China is tied with Belize in 107th place at 10 cars per 1,000 (source: www.nationmaster.com). The US leads with 765 cars per 1000. Of course, the US market may not be a fair comparison as it is a mature market with a historically large car population. A fairer comparison would be a market like Mexico with 138, Russia with 124, and Brazil with 81. Clearly, there appears to be upside growth potential for China. Forecasts of the China market over the next decade anticipate that the passenger vehicle population will grow from 100 – 200%. Global Insight’s base forecast anticipates growth in the passenger vehicle population from 10 – 153 million units from 2005 to 2030. The high forecast places the number at 327 million units. The bottom line here is that it is hard to be pessimistic China’s future automotive prospects. A key reason for optimism is the anticipated development of China’s lower tier cities. While China’s economic revolution has been clustered around the Tier 1 and 2 cities, it is important to understand the real impact that the lower-tier cities will have on the future development of the market.Interestingly, most multi-national corporations had focused their businesses and sales activities around the Tier 1 and Tier 2 cities. For example, Toyota has derived 20% of its sales in 2009 from Guangdong province, and 5 of China’s 31 provinces account for 49% of their sales. Similarly, VW generates 40% of its sales from its top 5 provinces. The Chinese local manufacturers, by contrast, are more focused on the lower tier cities. Local brands offer a better fit to the purchasing power of the consumers residing in these lower tier cities. Driven by the onset of the global financial crisis, the Automotive Industry Stimulus Plan published in early 2009 took specific measures designed to spark the growth of consumer demand in these lower income cities. Measures including the reduction of sales tax for cars below 1.6L engine displacement, along with subsidies for new minibus or light truck sales for rural residents have accelerated the auto market expansion in these markets, helping to boost the performance of the Chinese local manufacturers. Recognizing this, multi-national companies are placing more focus on the development products suited for the tastes and preferences of consumers in these lower tier markets. As a result, we can expect to see even more intense competition among the foreign and domestic brand vehicle manufacturers as they attempt to capture this growth opportunity (see Trend 6: Hyper-competition Across The China Auto Market Segments). As this is happening, the local manufacturers are striving to upgrade their brands and product portfolios to meet the more upscale image aspirations of Chinese consumers (see Trend 7: Local Vehicle Manufacturer's Push To Build Brand Equity). Clearly any growth strategy in China requires an understanding of the rapidly changing demographics and a plan to capture the growth in China’s lower tier cities. Taken collectively, it is clear that these trends signal a shift in the global center of gravity towards the east. The dramatic shifts that have occurred over the past year in the structure and brand portfolios of the vehicle manufacturers are simply the early stages of a process of asset reallocation and global realignment that will unfold over many years. These trends are reshaping the brands, products and global footprint of those who hope to prosper in the 21st century automotive industry. Indeed, China has taken center stage in the battle for global auto industry dominance. CHICAGO, Nov. 28 (Xinhua) -- U.S. auto makers will see a very gradual recovery in demand in 2010 after their dramatic restructure while many challenges will still remain, a U.S. auto industrial expert told Xinhua in an interview on Friday. Bill Russo, founder and president of Synergistics Limited and senior advisor with Booz & Company, has extensive experience in the automotive and electronics industries. When commenting on U.S. auto market in 2010, Russo predicts a slow recovery in demand in 2010 after the dramatic contraction in 2008 and 2009. "Many U.S. auto makers have had to dramatically restructure their operations to regain a profitable footing in their domestic market. Starting in 2010, the industry will gradually recover to above 10 million units. However, it will be quite a long time before we see overall industry volumes restored to the pre-crisis levels," he further explained. While everyone is hoping for a sustained recovery, Russo believes that 2010 will see a very gradual recovery in demand. While media attention seems to focus on the near-term sales performance and forecast, he thinks it is wise to view the market from a longer-term and "macro" perspective. "The U.S. auto makers have been in decline for almost 40 years, and have not yet addressed the structural weakness that has caused them to lose the loyalty and market share loss that began in the 1970's when the oil crisis caused Americans to seek smaller, more fuel-efficient cars from foreign car makers," he said. He warned that until U.S. auto makers begin to reverse this trend, their long-term viability is questionable. When asked about the biggest challenge the U.S. auto makers are facing, Russo said that like all global auto makers, they need to know how to deliver to the market the right products with a proper combination of value, quality and innovation to allow for sustained performance and growth. "They must also conceive of ways of leveraging their global businesses in order to improve the products and technology offerings for the American consumer. While Ford and GM are challenged to grow domestically, they have been able to enjoy strong growth in China," he said. "They must find a way to reinvest the proceeds from their global businesses in order to gain competitiveness in the U.S. market. They can achieve this by leveraging the cost structure and scale of their global operations when presenting products to the U.S. market," he added. When talking about the effect of the U.S. government incentive programs such as cash-for-clunkers, Russo thinks that they did provide some short-term relief, but they only buy time, because they do not provide a sustainable solution that addresses the root cause of the problem. "They prolong the problem and help sustain companies and brands that would have otherwise been dissolved. Consolidation is often a necessary step that allows the surviving industry players to emerge even stronger," he said. 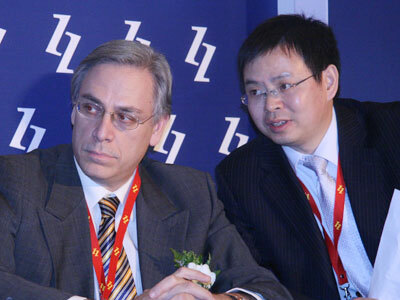 Regarding the role of the U.S. government in the auto industry, Russo told Xinhua "Ultimately, market forces should prevail and the U.S. government should be careful not to intervene too directly in the business, or they risk becoming a 'benevolent crutch,' without which the Big 3 can no longer walk." He suggested that the government must stop injecting cash either directly into these companies or into the market as incentives. Instead, government incentives should be redirected toward the root causes of the problem. "Mainly, the government should encourage the auto makers to develop cars that meet current and future consumer demand. They must also reduce the burden placed on manufacturers in the development of the next-generation green technologies," he said. Russo believes that the government can help fund research in the area of development of green technologies and create a vision for transition from an oil-based infrastructure to a "new energy" infrastructure, and must encourage consumers to migrate in this direction. When asked about his advice to the U.S. government, Russo believes they should accelerate their efforts to address the root causes of the problems noted earlier. "U.S. auto makers must eliminate underperforming assets and reallocate capacities away from segments and products which are no longer wanted in the marketplace. While this macro re-adjustment may take several years, they must avoid the temptation of relying on artificial incentives or they may not get an accurate understanding of true market demand," he said. Russo advised that the U.S. auto makers must leverage their global businesses and partnerships in order to more efficiently address the opportunities in the American market. Russo has more than 25 years of experience at driving strategy and performance improvement in Fortune 500 environments. In his role as the first vice president of North East Asia automotive operations for Chrysler, Russo successfully negotiated and secured government approval for six vehicle programs within a 3-year time period with three different Asian partners. He also oversaw the industrialization of the first Chrysler and Dodge-branded vehicles in Asia.